steak – Marie, Let's Eat! Somewhat overlooked in all the talk of regional barbecue styles is that there is a little outpost of restaurants in western Cobb County and Douglas County that all have very similar takes on presentation, sauce and preparing the chopped pork. I know that I’m not the first one to notice this. I wish that I could take credit for it, but somebody who actually deserves credit – and, you probably know me, I’m just not very good about remembering where I read things – noted an interesting similarity between the chopped pork at Austell’s Wallace Barbecue and a place in Douglasville that I have not yet tried, Hudson Hickory House in Douglasville. I made the connection, but didn’t note it anywhere, between Wallace and Briar Patch Restaurant, which is near Dallas and Hiram. A couple of weeks ago, I revisited Johnny’s Bar-B-Que and Steaks for the first time in four or five years and realized just how similar this place is to the others. If you pull up these on a map, you’ll see that they’re all in the same little quadrant, north of I-20 and east of I-285. Now, I can’t speak with certainty about Hudson Hickory House, but I have seen a photograph of a chopped pork plate at Courthouse Bites and read a description of the meal at BBQ Biker and I think I’m on pretty safe ground when I discuss it in general terms. All four of these older restaurants serve very soft chopped pork that is presauced and swimming in a very thin, red-to-black, mild and very tangy vinegar-based sauce, while also offering a much hotter mustard-based sauce on the table. The fries are freshly-cut, whole potato-style and very greasy. BBQ Biker describes Hudson’s as “floppy,” which can certainly be used to define the fries at the other three restaurants. The stew at each is very thick, heavy on the onions but not too many other vegetables. When I do get the chance to visit Hudson’s, and I will, soon, I will definitely have to ask about the similarities that I’m seeing here. I’ll make a note to go after the lunch rush so somebody might have a chance to talk with me. It might not be to everybody’s taste, but this is an absolutely fascinating discovery. Barbecue lovers, you need to get out here and dig into this region and see what I’m talking about! A couple of Saturdays ago, Marie’s mother came to town and we had a pretty good time and enjoyed some good meals, although I think her favorite of the dinners out must have been our lunchtime trip to Vingenzo’s in Woodstock. That really is some unbelievably amazing pizza. She doesn’t actually care for barbecue, madly, and so, for supper, I tried to come up with someplace that we hadn’t covered in the blog before that I knew also offered pretty good steaks and burgers. David had taken Neal and me to Johnny’s several years ago, and while I didn’t remember the details, I remembered that it was a big Saturday night family dinner place, so I asked whether we could meet at David’s place and ride over there. If you’ve eaten at Wallace recently, then Johnny’s will give you a case of déjà vu. It’s not merely the similar style of cooking the pork; the interior and the design is very familiar. The great big room with rustic 1930s bric-a-brac on the walls feels very comfortably similar, like you’ve been here before. I was pretty taken with the food at Johnny’s, though I would have preferred to try the meat dry. The sauce is gently tangy and not very sweet, but the mustard sauce on the table is among the hottest barbecue sauces that I have tried recently. It’s a menace, and makes a great dip for the “floppy” fries. Marie had the ribs and enjoyed them very much, her mother had a burger with some really good baked beans that she liked more than the main course, and David had a steak that didn’t set his taste buds alight, but he said it was pretty good. Well, now the next question – as soon as I’ve made my way to Hudson, anyhow – is how many more restaurants in the area serve barbecue in this style? Four big established places in such a small radius definitely makes a trend, but I wonder how widespread it is? More research, as ever, is needed! I had not realized quite how much attention that I have been paying to Urbanspoon until I looked up Jim Stalvey’s Restaurant, noted the surprisingly low user ranking (44%, if I recall, the morning that we visited), and asked myself why on earth we were going to head out that way. The answer, of course, was that the venerable steakhouse is one of those with a glowing review at Roadfood.com and we intend to hit (almost) all of the ones in Georgia, and so we just had to brave that 44% and hope for the best. It worked out just fine. 56% of the people who voted for that restaurant were quite spectacularly wrong. If you’re looking for a good steak, you need to head out to Newton County and then log on to Urbanspoon and give that ranking a boost. The building is a very old one, sort of classic suburban family restaurant design, and easy to overlook among the sprawl of US 278. I asked about it, wondering whether it might have once been a Ponderosa or something like that. It was apparently built in the early 1960s as the home of a restaurant called Bock & Kid. Jim Stalvey, a restaurateur from the north Georgia town of Rome, had already moved to Covington and opened a place in town with the horrible name of The Crest. In 1980, he moved into this site with a business called The Prado. In time, the Prado evolved into Stalvey’s Restaurant and Lounge. Stalvey has continued to open and operate restaurants along this leg of I-20, though the last few years have not been kind to them. At the end of 2005, one of his websites – not updated since then – boasted that he and his company ran seven. Presently, I count just four: Stalvey’s, a fast food place called Quik Chick, and two Butcher’s Block delis. Perhaps one day, we might visit the others. If they are as good as the main restaurant, they’re worth the trip. The four of us drove out to Covington with Neal some three Saturdays back. Covington has always been one of those towns that we pass through without stopping; I’ve been curious what else might be out here. The must-try items at Stalvey’s are said to include the onion rings and the fried cauliflower. I had the former and thought they were completely delicious. Happily, they were available as a side for my steak and not just as a more expensive appetizer. The steak was really wonderful. I had a small six-ounce sirloin, priced right at just $8.99. It was not as good as Marie’s own grilling at her best, but better than many, many steaks that I have ordered in restaurants in the past. 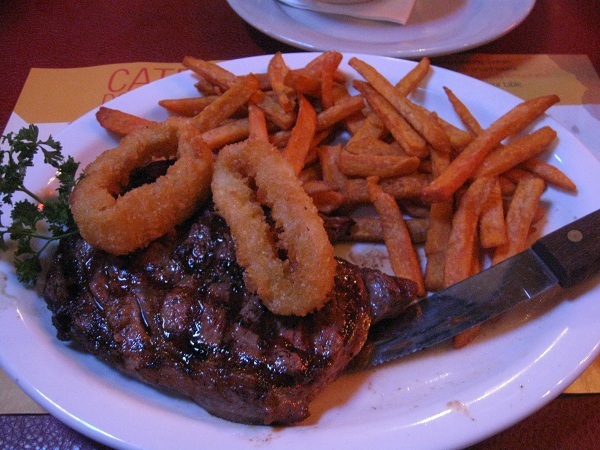 Marie also had a steak – the filet was available as a special, also for $8.99 – and was very pleased with it. Neal had the chicken livers and really enjoyed them. He said they were not quite as good as the ones at Doug’s Place in Emerson – those are the gold standard – but still very good. I’m glad that we came by for lunch and were able to enjoy them. Apparently, if I understand it correctly, the restaurant offers both steaks and a traditional southern meat-and-two menu, on a white board, during lunch hours, but in the evenings, it’s all about either steak or ribs. The smokehouse is in front of the restaurant, but barbecue is only offered in the evenings. Everything that we had tasted incredibly fresh and wonderful; the only slightly bum note came with the French dressing that Marie had with her salad and did not enjoy. Happily, the salad was made with such incredibly fresh veggies – these cucumbers are just to die for – that it did not need dressing at all. Now, admittedly, Urbanspoon is a very poor judge of traditional restaurants like this. Its more prolific users seem to be more interested in the hot new joints in town, eating where everybody else eats, and often enjoying food that, as Calvin Trillin terms it, is always served on a bed of something else. The very low positive rating for Stalvey’s probably indicates a period of inconsistency for this restaurant. What surprises me more, however, is that only 26 people had rated it at all. This is a restaurant that more people should talk about. If you can get a better steak for this price, with sides and vegetables this good, anywhere for forty miles, I’ll be stunned. This is Marie, weighing in on the visit we made recently to The Cherokee Cattle Company. Admittedly, my contribution on this one is in large part because there are desserts involved, though the food itself was quite tasty. My father-in-law picked this location for his birthday dinner. It is one of a small group of four local restaurants, each of them with a different name and arranged around a different theme, owned by “friend-of-Food-Network” Gus Tselios. Marietta Fish Market, Pasta Bella, and the original Marietta Diner are the other three locations. 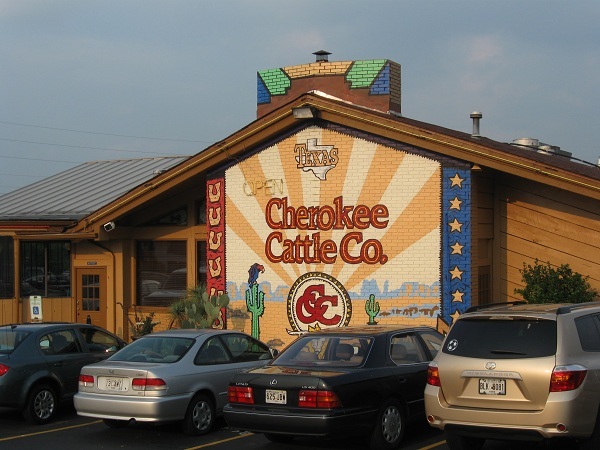 The Cherokee Cattle Company is a steak house and actually predates the other stores. For years, it was independently owned and proudly fought off regional competition from the likes of Longhorn and Outback, but joined the “Diner Family” in 2008. The menu was changed somewhat to fall in line with the others, and to bring the somewhat outsize dinner portions and ridiculously outsize desserts to Canton Road. One of the best things about this particular location is that of the four, it’s the only one where you don’t usually have to wait for a year and a half to get a table. Mainly it’s just that it’s the biggest of the places, and the parking isn’t quite up to the capacity of the interior (an interior, I should mention, filled with things like antler chandeliers, but if you can ignore that sort of thing you’ll be fine). One of the worst things (for me–it won’t be a problem for anyone but the other four people in the universe who dislike the stuff) is that this place has an unnatural fondness for bacon. Having it appear on my salad was a little discouraging, if for no other reason than that I honestly ought to have remembered from last time that a vegetarian salad needs a special request. However, there were folks at the table willing to take the contaminated salad off my hands, and give every appearance of enjoying the favor they did to me. Steaks don’t make it onto my plate very often. Most of the time they’re too big for my appetite. Also, since a bad steak is worse than no steak at all, they only get ordered when there’s plenty of money in the budget, or when there is a special occasion. I chose a rib eye because Grant doesn’t like that cut much and I’m disinclined to get a bunch of different slabs of meat for home cooking when it’s so hard to keep track of what is finished when. Which is, of course, one of the benefits of going to a steak house–timing the cooking is someone else’s problem. Actually, the best steak on our table was my father-in-law’s, which came with a bucket containing enough horseradish to clean out the sinuses of Napoleon’s army on the way back from Moscow. The sweet potato fries are almost thick enough to reach towards home fry status, which as I understand it is a little hard for sweet potatoes as the sugars caramelize rather quickly. Generally fry portions defeat me well before half-way, but these were worth munching a bit longer, in no small part because the thicker fries held their heat better. Grant got the salmon. Just because we were down the street from the place that specializes in fish doesn’t mean he got second-best; it was very well made, quite simply (as is best for fish) and with a little bit of crispiness around the edges. However, as has been said before, he likes fish rather more than I do, so we were not in danger of menu envy this time. We closed the meal with some of the death-defying desserts. The selections of the table included cheesecake with and without strawberries, tiramisu cake, and some kind of death by chocolate concoction. Please note that there were seven of us, my piece of cheesecake was bought separately as a take-home item, and we still managed to bring home samples of every one of the cakes along with our other leftovers. Do not come to any of the four locations without a really good appetite, or an awful lot of time, unless you plan to leave with enough for tomorrow’s lunch box and maybe a snack after work, too. But do take home some dessert even if you can’t choke it down immediately after eating yourself silly. Just because the pieces are bigger than your head doesn’t mean they skimp on the quality.